The design of the revitalized Washington Monument grounds is bold and clear; a minimalist solution that turned a project originally funded to prevent terrorism into a handsome civic amenity. It demonstrates that the union of sound security and artful design is not only possible, but can also be functional and graceful. 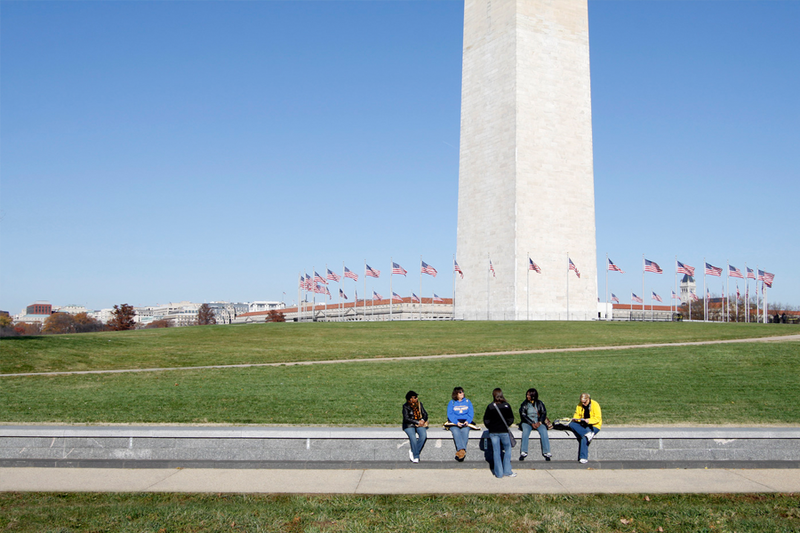 The Washington Monument’s 72-acre grounds serve a vital cultural and civic role, providing a public space for demonstrations, celebrations and recreation for millions of people each year. A need to upgrade exterior security provisions came to the forefront after 9/11, leading to an invited design competition for the monument grounds. OLIN won the competition with an elegant security solution, and in the process, successfully proposed much needed landscape improvements. The design brings resolution to the landscape deftly. Representative of this are the low granite walls configured in a graceful pattern appropriate to the spirit of the Mall and the monument. The walls are key to the design and serve to protect the monument, provide visitor seating and assist with retaining the grade to make paths accessible. New plantings, lighting, furnishings and a granite-paved plaza at the base of the monument breathe life into the visitor experience and foster interaction with the cherished and iconic memorial.